Standing in John Woodrow Kelley’s West Knoxville home and studio is like being transported to an idyllic Italian countryside villa. Beautiful light streams through the large French windows that look out to a view of the Tennessee River. John’s paintings adorn the mostly wall-papered walls, along with unique thrift finds. Fossils, books, and ornate treasures are arranged on desks and tables. 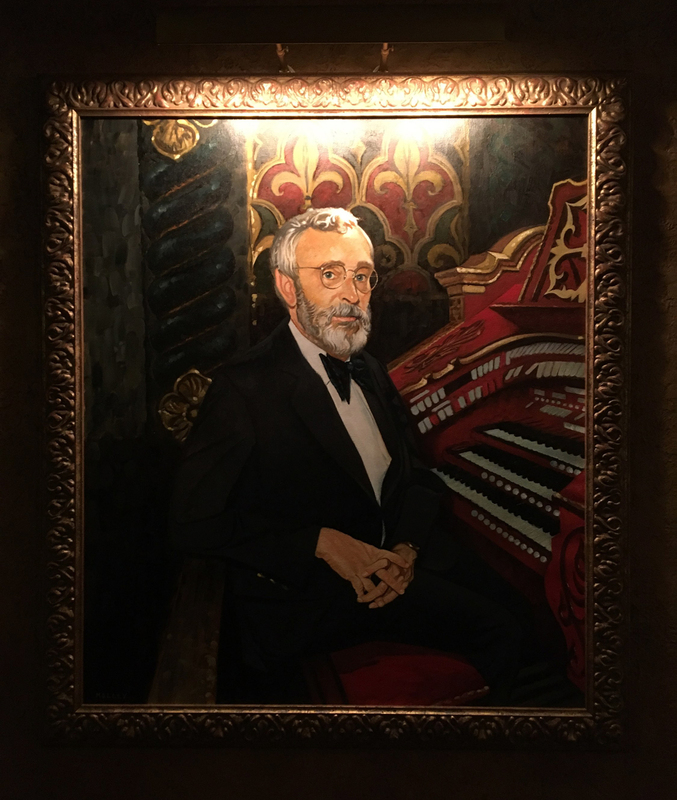 Primarily living in New York City, Knoxville native John Kelley shared with me his experiences as a painter, his relationship to the Tennessee Theatre, and about his new portrait of recently retired Tennessee Theatre Organist, Dr. Bill Snyder. 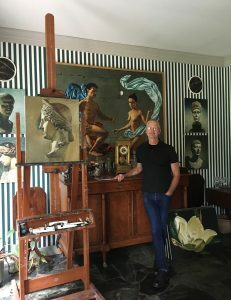 John Woodrow Kelley in his Knoxville studio and home. TT: Having grown up in Knoxville, tell me about some of your early experiences as a guest at the Tennessee Theatre. JWK: The Tennessee Theatre was my favorite place in Knoxville to go when I was a child. Growing up in a world of suburban ranch-style homes, modernism, and sea green tile, stepping into the Tennessee Theatre was like walking into the Hall of Versailles. To me, it indicated a larger world and gave me a glimpse into grand European culture. I saw many, many, films at the Tennessee Theatre both as a child and as a teenager. When I was a junior in High School, I remember my mom would often drop me off at the bus stop at Western Plaza on Saturdays, where my friends and I would meet and take the bus downtown. We would watch a movie or two at the Tennessee Theatre, have lunch at the Orange Julius, shop a little at Miller’s Department Store which was still on Gay Street – it felt very urban and sophisticated to spend a day like that downtown. It was attending movies at the Tennessee Theatre, and going to see the full-scale replica of the Parthenon in Nashville that made me feel like the world was much bigger than what I knew in Knoxville, and they inspired me to learn more about the world, history, and culture. TT: You have a degree in Art History from UTK, and a degree in Architecture from Pratt University, before studying painting and drawing at the Art Students League of New York and the New York Academy of Art. Did you imagine you would be an artist or an architect? JWK: I was a very serious young man, and it was when I was 17 years old that I wrote down a list of goals I had for my life. 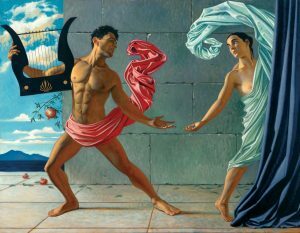 The list included creating a contemporary painting series based on Greek Mythology. After receiving my Architecture degree from Pratt, I worked at an architectural firm in Midtown for a time, but it was just exhausting and stressful – I realized quickly it wasn’t for me. I thought, “what about my list of goals! ?” Once I began receiving commissioned portraits, I saw how It would be possible to have a career as a painter. TT: Your portrait of Bill Snyder is very impressive! It is both representational, as well as very painterly. Tell me about your experience working on the portrait of Bill Snyder. JWK: If you look closely, there is a hierarchy in the brush strokes – the detail is in Bill’s features. His face and hands are rendered with detail, while the organ and the background are painted with more loose, gestural marks. Considering that, the railing was exciting to paint – just a few, decisive, marks and it was finished! What you don’t paint is just as important as what you do paint. I also enjoyed pulling out the highlights in the ornamental plaster work behind Mr. Snyder – I tried to create a cascading effect behind him. Having been asked to paint the Bill Snyder portrait is an incredible moment in my career. I feel as though I contributed a cultural artifact to the Theatre. I can’t think of a more wonderful honor! TT: For your commissioned portraits, do you typically work from the model or photographs of the subject? Are you able to meet the people you are commissioned to create portraits of? JWK: Either or both. It’s up to the client – I listen to their requests and am always up for a challenge. It’s the effect of the piece itself that is most important, so however it needs to come into existence I can do. With the Bill Snyder portrait, I sat down with Becky [Executive Director of the Tennessee Theatre] to look at photographs of Bill. I was immediately taken with this one photo. He looked very regal, yet casual at the same time. It was a moment captured where he was proudly seated at the organ, but also at ease. The great portrait artist, John Singer Sargent’s subjects have that same quality. 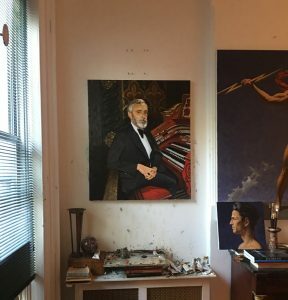 In progress portrait of Bill Snyder in John Kelley’s Brooklyn studio. TT: Tell me about living in NYC the past 30 years. Besides painting, what do you spend your days doing? JWK: I love walking around New York City and looking at the incredible architecture. You can often find me wandering around the city gazing up at the buildings. I also love riding the subway – you can find people from all walks of life, and all ethnicities in the same small space. There are also a number of thrift shops I make my rounds at, looking for new treasures. I frequent many museums, but especially haunt the Metropolitan Museum of Art. I’m there at least once a month, sometimes more. It’s not just the special exhibitions that draw me, I constantly see new aspects of the permanent collection, no matter how often I look at it. 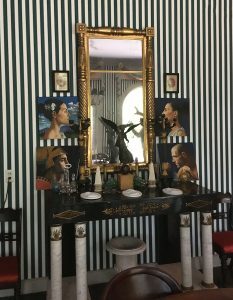 I am also proud of my relationship with the Institute of Classical Architecture and Art in Manhattan, which I have helped developed and grow for many years. I am a fellow of the Institute, and I teach drawing there. TT: Tell me about how Knoxville has changed in your lifetime? JWK: I am so proud of my hometown and the Renaissance it’s currently undergoing. All of the changes happening downtown are integrated with the historic buildings, which is meaningful to me – the convergence of history and growth. I love Lakeshore Park! I think of it as Knoxville’s “Central Park.” When I was growing up in Knoxville, Lakeshore Mental Health was on the site – and while they did important work in Knoxville for over a century, to a child it was an eerie place. When I am in Knoxville, I walk on the trail in Lakeshore Park almost every day. TT: Do you frequent the Tennessee Theatre currently, and if so, what type of events do you attend?